Song Segue Panels in the Schedule Editor - by Paul Ziino – WELCOME TO OUR INTERNATIONAL SUPPORT! A new feature found in 5.0 is the Song Segue panels. 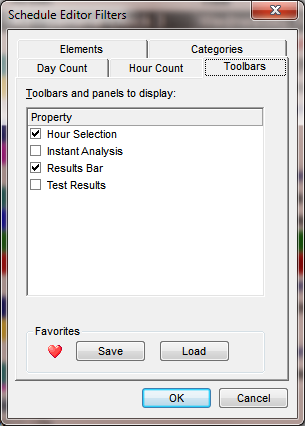 Open the Schedule Editor and activate the Results Bar by clicking on the Toggle Toolbars icon , selecting the Toolbars tab, and checking Results Bar in that list. Now within the Results Bar you can right-click and customize your layout. Two new panels, Song Segue: Separation and Song Segue: Nearest Plays are available and can be added to your Results Bar. Once you’ve added either or both of those panels to your layout, click on a song in the Schedule Editor. MusicMaster will look at the song prior to it in the log and search back and ahead in the available history to find when the last/next time those two songs played back to back in that order. That info will be displayed in the Song Segue panels. 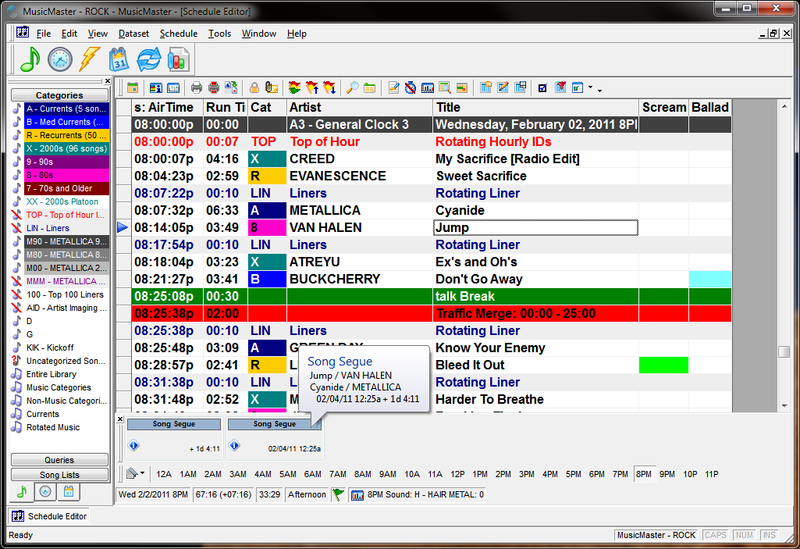 In the example below, “Jump” is the selected song. MusicMaster is looking at the last time “Jump” and “Cyanide” played back to back in that order together both back and ahead. The Separation panel presents the information in Days Hours:Minutes—in this case “Jump” played after “Cyanide” coming up in 1 day, 4 hours, and 11 minutes. The Nearest Play panel presents the info with the specific date and time of that play, February 4th at 12:25am. Hovering on either panel will present a balloon that displays the full info found in a combination of both panels. The Song Segue panels test any item scheduled from a MusicMaster category. So if we click on “Cyanide”, MusicMaster will tell us the last or next time it is playing next to “Rotating Liner”. However, we can tell MusicMaster to ignore items that are up to 15 seconds in length. This is done under Tools/Options/Additional Properties. Under the Schedule header you’ll find SegueGapTime. You can use a setting here from 0-15 which represents the length in seconds of items you wish the Segue panels to ignore. Once set, click Apply and OK and now when we click on “Cyanide”, MusicMaster will ignore the “Rotating Liner” and instead test against “Sweet Sacrifice” and present that data for us in the Song Segue panels. Please note, you’ll have to close and re-open the Schedule Editor for the adjustment to take hold. 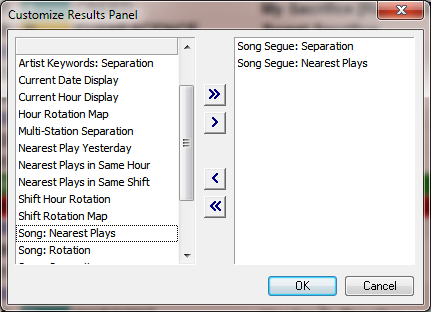 The Song Segue panels are just one of many new features in 5.0. Contact your Music Scheduling Consultant or check out our “New Features Bulletin 5.0” (PDF) to learn about them all!